This story was originally broadcast on a special episode of the Texas Standard called “The Wall”, an hour-long look at the prospect for an expanded border wall under the incoming Trump Administration. Gov. Greg Abbott has described parts of the muddy Rio Grande as “serpentine regions” running through the pristine Big Bend National Park. Abbott has said he does not want to see a border wall built in the park and that there are other parts of the broader Big Bend region where a wall would be “extremely difficult” to build. But that region is huge. 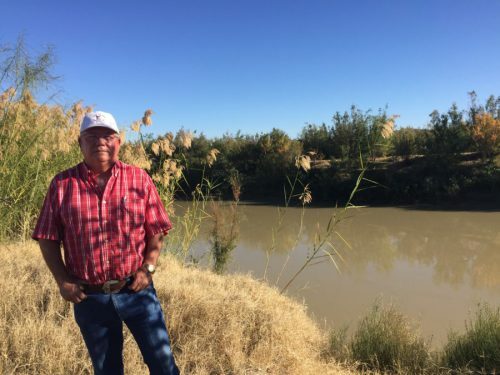 A couple hours west of the park near Presidio, Texas, alfalfa farmer Terry Bishop walks to the banks of that same winding river. He points out that you can easily toss a rock underhand and hit Mexico. This isn’t the first time Bishop’s been faced with the prospect of a wall or fence coming through his property, and it’s not the first time he’s thought about how it would change this landscape he’s known for decades. More importantly, he says a wall would change his livelihood and possibly even ruin it. So what’s he doing about all this? Like many people thinking about the wall, Bishop doesn’t know what to do but wait and see. Roy Brandys is an Austin attorney who represented South Texas landowners in disputes against the federal government when the border fence there was being built in the late 2000s. “We all kind of don’t know what the situation will be under the Trump administration and how they’ll proceed,” Brandys says. He says there are two key ways landowners can stay plugged in: get to know Border Patrol agents and talk with their neighbors. “There’s going to be some information out there that the group will have, as opposed to maybe an individual,” he says. While Brandys says border landowners should keep a close watch on the government’s plans for any new fencing, there aren’t many ways to challenge those plans. The only real success his clients had in South Texas was to delay construction for a while or to negotiate how much money they’d get from the government as compensation. “You’re left with really understanding that it’s probably going to happen, and your remedy – or your right – under the constitution is to ensure that you get fair and just compensation,” Brandys says. During the campaign, some borderland Trump supporters said they’d welcome a wall, but they were a minority. Even though that promise drove Trump to victory, some who scoffed at the idea, like Presidio Mayor John Ferguson, still have faith that there’s room for a more nuanced debate about how to solve immigration problems without a wall. “If there were anybody who would be willing to listen, we really need as the United States to consider ourselves not a gated community, but neighbors with these people,” he says. Ferguson would like to see the U.S. work with Mexico and other Latin American countries to “address the root causes of this immigration.” He’s encouraged by Abbott’s comments about the wall in west Texas. “If we can get other people to come in and take a look and say, ‘do you really think that’s what the answer is in this part of the world,’ you know maybe, that might be a chance,” Ferguson says. Back on the river, Terry Bishop notes he’s got friends and family who work for Customs and Border Protection. While he’s not hopeful he could stop a wall from coming here, he hopes those connections could at least help foster honest, open conversations. It’s almost disorienting to hear such measured talk about working together after such a bitterly divided political season. But at this point, that approach is probably Bishop’s best chance to have any say in how the promise of a “great wall” plays out. This entry was posted in KRTS News and tagged Agriculture, Big Bend Region, Border Issues, border wall, Farming, President-elect Trump, Rio Grande, Trump Administration, Water Use. Bookmark the permalink.